Terence Victor Moore joined the Territorial Army in 1939 with the 2nd/5th Battalion West Yorkshire Regiment mobilised in 1939. He saw service overseas with this regiment together with the royal engineers and Royal Artillery regiments. In 1942 he responded to the appeal for volunteers to undertake hazardous duties which led to the formation of I Detachment 1st Special Air Service Brigade under the command of Major David Sterling DSO and Captain R B (Paddy) Mayne DSO. He saw service with this Regiment in the Middle East, Africa, Sicily, Italy, France, Belgium, Holland, Germany, Norway and the United Kingdom. This document was signed by Major Mayne the Commanding Officer of the Special Raiding Squadron and countersigned by Field Marshal B L Mountgomery for a special award of the Military Medal. It was in 1944 that he parachuted into France to assist the French Marquis with whom he established strong bonds of friendship which remained until his death. By 1945 he had attained the rank of Squadron Sergeant Major and later became attached to the Sherwood Foresters Regiment when the Special Air Service Regiment s were disbanded. Demobilised in August 1946, Terry Moore saw service with the Queen Victoria TA from 1947 until 1957 again attaining the Rank of Company Sergeant Major. He was until recently Honorary Secretary to the Queen Victoria Rifles Association and Committee members also undertook fond raising in respect of Rifleman�s Aid a cherity for former riflemen who had fallen on hard times. In the 1950�s he went to South Africa and Rhodesia to join his war-time commanding Officer, Lieutenant Colonel David Stirling, who had set up the Capricorn Africa Society. After some three years he returned to England and resumed in Freemasonry with the Bloomsbury Rifles Lodge. For his unstinting generous and sterling work he was honoured with the Rank of Grand Officer. contributed by Theodore J. Shannon I was part of Spearhead unit of AMGOT 8th Army moving forward with the troops to extablish Military Government upon the fall of Termoli. We were slowed as we traversed a "diversion" at the site of a blown bridge; our jeep and other foundering vehicles became slow moving fat targets for the strafing Luftwaffe. We dove out and saved ourselves in the mud. The battle turned against us and I fell back and set up shop in Serracapriola. I have established above that Dad was a member of �B� Brigade 2nd SAS involved in Operation �Jonquil� when he was killed in the Battle for Termoli. In these following paragraphs I will track the paths of the three groups of SAS soldiers that came together for the climax of that battle. A unit called the Special Raiding Squadron. This was originally composed of 1 SAS, commanded by Lt Col Blair "Paddy" Mayne, one of the "originals" of Stirling's SAS, and 1 SBS, commanded by George Lord Jellicoe. After 30 Sep 43, SRS, now only the 1 SAS element, operated out of Bari, Italy. SRS took part in the Termoli operation with 3 and 40 (RM) Commandos. The objective was to prevent German units facing 78th and 1st Canadian Divisions, thought to be rear elements of the 1st Fallschirmajeger Division, from taking up defensive positions on the Biferno River. The operation was to take Termoli port from the sea, thus outflanking any defensive line on the river. Source: The Commandos 1940-1946 by Charles Messenger; London; William Kimber; 1985; pages 210-213. The plan was for 1 SAS (or SRS) to move through the eastern side of the town and secure two bridges over the Biferno, where it would make contact with 78th Division; the division would advance to the north. At the same time, 3 and 40 (RM) commandos were to thrust to the southwest. In the event, 3 Commando made a dry landing and established a beachhead with no difficulty. Mayne and 207 men from SRS (probably A Squadron) and 40 (RM) Commando came in on LCIs, the SRS on LCI 179. Both units grounded about 50 feet offshore and had to use the LCAs that were being towed by the LCIs to land. Mayne and his men had sailed from Manfredonia the previous night on this LCI. After they moved through the beachhead, SRS moved to execute the plan. By the way, Roy Farran and 20 men from 2 SAS had accompanied 78th Division in jeeps and were on the scene of the action that day. Two of my sources reported that, on the day of this landing, Mayne was a Lieutenant Colonel and one said he was a Major. Colonel Paddy by Patrick Marrinan; The Ulster Press; 1960; page 134. The Commandos 1940-1946 by Charles Messenger; London; William Kimber; 1985; pages 210-213. The SAS at War - The Special Air Service Regiment 1941-1945 by Anthony Kemp; London; John Murray; 1991; pages 93-94. Following is a short account on French SAS 2nd SAS Rgt. not the famous French Squad 1st CCP of SAS Brigade (D.Stirling). I beg your pardon but my English is not perfect. I was tradition officer of french SAS Rgt. during 2 years and the SAS History is very important for me (particularly WWII). Immediatly after the allied landing in North-Africa (Nov 1942) the 2nd SAS Rgt. came in Philippeville-Algeria. This small town near the sea with long sand beaches was an important garrisson for french forces. It was easy to create with volunteers coming from zouaves, tirailleurs and legionnaries, a small special unit named French Squadron under the command of Lt Lee-Couraud who was as a Sergeant in French Foreign Legion during Norway operations of 1940. After he was a British 2ndLt in Commandos during the raid on St-Nazaire. The first important raid by allied forces in the Italian area was to try to destroy Luftwaffe radar in the isle of Lampedusa. This mission was completed by french squadron and a commando group. In may 1943 a second mission is given to french squad: raid on Pantelleria. Immediatly after it was "hawthorn" operation. At this time the S.A.S operated for the Italy battle... The french squadron is now in Italy. With the Roy Farran Squadron, the french fight against the axis-forces who retreat. The fights are strong. Foggia where the SAS are the first...Lucera...San-Severo. Around Termoli the enemy forces are heavy and it is very difficult to make advances. After a time Termoli is taken by a landing of 1st S.A.S and 3rd Commando. The 2nd S.A.S came to Barri and only the french squad stayed in the Termoli area. The situation became hard, all allied forces moved into Termoli; the 2nd S.A.S also. Ambush, recons, patrols and guarding of prisonners were the missions of french squadron. On 12nd November, the 2nd S.A.S is in Termoli. For it and for the french squad the Italian battle is finished. The french squad will be assigned to french forces few times after. It will move to England with french 3rd S.A.S and as a part of this regiment will form the jeep squadron in June 1944 under the command of Lt. de Sablet, who was the second of Capt. Raymond Lee Couraud. Capt. Lee will be in France with the 2nd S.A.S for the operations of Center area from June 1944. 5/10/43 On the night 4/5 Oct. 3rd CLY received order from 78 Div to send one squadron under command 11 Brigade and one under command 36 Brigade early next morning in the TERMOLI area. At first light on the 5th Oct. the situation on 11 Brigade front was judged to be the most critical so that C Sqn who were first to cross the BIFERNO river, went to their support with all possible speed. Unfortunately after 6 tanks had crossed the ford became unpassable and owing to the size of the blow in the bridge and to continuous enemy shelling, the REs could not complete their work until 1420. Units involved in the raid at Termoli were the former "A" Squadron, 1st Special Air Service (SAS) became the Special Raiding Squadron led by "Paddy" Blair Mayne, DSO. The other units involved in the raid were Number 3 Commando and Number 40 Royal Marine Commando. Jim Collins. "The Special Air Service" by Philip Warner (1971) pp. 126-127 States raid on Termoli on 1943 Oct 03. raiding force consisted of Specail Raiding Squadron, No. 3 Commando and No. 40 Royal Marine Commando. "The Special Air Service" - Men-At-Arms Series # 116 by James G. Shortt & Angus McBride (1981) pp.11-12 "The former 'A Squadron, 1 SAS became the 'Special Raiding Squadron', still led by Paddy Mayne. In July 1943, the SRS played a spearhead role in Operation 'Husky', the invasion of Sicily; ... [later]...SRS suffered heavy losses in October 1943 at Termoli, when, alongside 3 Cdo. and 40 RM Cdo., they ran into the German 1st Parachute Division ... at the end of 1943 Special Rainding Squadron reverted to the title of 1 SAS." My recollection of the landing is that in raid terms it was a classic landing.I am sure that there was no "advance team" re guards and that 3 Commando had a dry unopposed landing. We set down at 2:30 am and it was obvious that the Germans were asleep and completely unaware of the imminent raid. Usually to protect a coastal beach, mines would have been laid and this was not the case. Having established a perimeter bridgehead without any firing the way was clear for 40 unaware and SRS to land and move into their positions to take their objectives. This was unopposed. Most of the Germans were caught asleep and others woken by firing - by 8 a.m. all objectives were taken. The town was then quiet and gradually units of the 8th Army (78th Div.) were crossing the Biferno River, the bridge was being repaired to get heavy equipment, tanks etc., across. By noon the next day the 8th Army troops took over and the Commandos were returning to the town. The situation then changed as the Germans started an attack to retake the town, the port and their river defence line. This attack had been strengthened by the arrival of 26th Panzer Division to assist the Germans who had been driven from the town (some written accounts refer to these being 16th Panzer. Commandos were then put back in line to assist the troops. 3 Commando was in an olive grove north of town. The attack was heavy, supported by German aircraft that swept in from the sea dropping bombs and straffing our position. The 78th Div. troops were driven back into the town and our position in the olive grove was eventually surrounded on three sides - we were instructed to hold the olive grove as long as possible so that the 78th Div. could get men and material across the river for a counter attack. We spent all day in the olive grove repulsing German attacks and was able to do so mainly because the did not come into the olive grove with their tanks. It was apparent they were unsure of what weaponry was in the grove and did not wish to risk the tanks. It was in the early hours of next morning that the order to vacate the olive grove was given and we had to creep out as quietly as possible in single file, back to town. The next day saw 78th Div. able to push the Germans back. 3rd October, 1943 S. R. S. with No. 3 (Army) Commandos and No. 40 Royal Marine Commando land and attack Termoli. The Special Service Brigade under Brigadier J. Durnford-Slater, DSO took the beach area and town, with casualties, their opponents being German parachutists. Captain J. Tonkin's S. R. S. section was surrounded and captured in the town, he later escaped. I have found in the Italian edition of the book "Tug of war. The battle for Italy 1943 - 1945", authors Dominick Graham and Shelford Bidwell, edited in 1986 by Hodder & Stoughton, a short account for the Termoli raid, or more exactly battle. I enclose a copy of the Italian text, hoping you will be able to find the original english book. The interesting part is that one regarding the commandos action. They where depending from the 78� Infantry Division and from the 40� Royal Marines. Quando l'8� armata raggiunse la linea difensiva tedesca sul Biferno, Montgomery decise di utilizzare i pochi mezzi da sbarco per aggirare il fianco nemico dalla parte del mare con un assalto anfibio, mentre la forza principale attaccava frontalmente. Conquistando Termoli, una piccola citt� 3 km a nord del Biferno, avrebbe efficacemente tagliato la linea della ritirata tedesca lungo la statale n. 16. Termoli era occupata soltanto da un piccolo distaccamento del Genio ferroviario, rinforzato da un plotone di paracadutisti, il cui battaglione d'appartenenza copriva nell'entroterra il fiume Biferno verso ovest. L�attacco iniziale fu eseguito da due unit� di Commandos britannici, che fungevano da reparto d'assalto per la 78� divisione. Il piano prevedeva lo sbarco dei Commandos davanti alla citt� prima dell'alba del 3 ottobre, mentre l'l1� brigata, il 56� reggimento di ricognizione divisionale e sei carri armati Sherman del 3� Yeomanry della Contea di Londra dovevano attraversare il fiume per raggiungerli. I pochi mezzi da sbarco disponibili sarebbero allora tornati indietro, avrebbero preso a bordo la 36a brigata (naturalmente ridotta a dimensioni d'assalto) per sbarcarla a Termoli nella notte fra il 3 e il 4 ottobre. I Commandos della 3a armata e quelli del 40 Royal Marines ripulirono Termoli dai nemici; quelli non catturati vennero rapidamente dispersi. I tedeschi avevano fatto saltare il ponte stradale sul Biferno, ma i genieri, per quanto a corto di materiale, costruirono un ponte di barche sul quale riuscirono a passare i pezzi anticarro e qualche veicolo da combattimento del reggimento di ricognizione divisionale, mentre la fanteria guadava a piedi l'acqua non troppo profonda del fiume. A questo punto il �generale Fango� prese in mano le cose. Il 3 ottobre cominci� a piovere forte, le acque del Biferno arrivarono a un livello alto abbastanza da impedire il guado, e le deviazioni intorno alle zone demolite sulle strade di approccio si ridussero a una palude vischiosa in cui s'impantanavano gli indispensabili carri armati, l'artiglieria da campo e veicoli che trasportavano munizioni. All'interno della testa di ponte, si rivel� impossibile spostare i cannoni anticarro fino al perimetro difensivo dove c'era urgente bisogno di loro, perch� al �generale Fango� si era aggiunto l'ancor pi� temibile generale Sieckenius. When l'8� army reached the defensive German line over the Biferno, Montgomery decided to use the few landing crafts for overturn the hostile side from the part of the sea with an amphibious assault, while the principal strength attacted frontly. Conquering Termoli, a small city 3 [km] north of the Biferno, he would have effectively cut the line for the German withdrawal along the government n. 16. Termoli had occupied only by a small detachment of the railway Engineer, reinforced by a platoon of parachutists, whose battalion covered on the hinterland the Biferno river toward west. The initial attack was performed by two units of British Commandos, that acted as assault units for the 78� division. The plan predicted the landing of the Commandos in front of the city before the dawn of October 3, while the 11� brigade, the 56� regiment of divisional recognition and six Sherman tanks of the 3� Yeomanry of the County of London must cross the river in order to reach them. The few available landing crafts would be then gone back, they would have taken aboard the 36a brigade (naturally reduced to sizes of assault) in order to land it in Termoli in the night between the 3 and October 4. The Commandos of the 3a army and those of the 40 Royal Marines polished up Termoli from the enemies; those not captured they came quickly lost. The Germans had made spring the road bridge over the Biferno, but the engineers, through as for short of material, they built a bridge of boats over which they were able to pass the antitank guns and some fighting vehicle of the regiment of divisional recognition, while the infantry forded the river, the water not being too deep. At this point the "general Mud" it took the matters in hand. October 3 it began to rain loudly, the waters of the Biferno came to a high level enough to obstruct the ford, and the deviations around the zones demolish over the roads of approach they were reduced to a sticky swamp in which they got bogged down, essential tanks, the field artillery and the vehicles that transported ammunition. Inside of the bridgehead, it proved impossible to move the antitank guns up to the defensive perimeter where there was urgent need of them, because at the "general Mud" one was added the still more dangerous general Sieckenius. Sunday, October 3, Foggia #8 Rain nearly all day today. We are grounded as the field is unserviceable. Rain again tonight, but champiagn to wash down out low spirits, helped us to sleep. Jerry is still withdrawing and the British are taking their time following him. Well probably move forward in a few days. Monday, October 4, Foggia #8Had the day off. Went back to Bari with will Tilson. It really is a nice town. Wanted to buy some Christmas gifts, but everything is so expensive. I didn't see a single bombed building. It's a modern town of 275,000. Lots of pretty women, fine shops and some attractive modern buildings. One mission today. No strafing target reported. Wednesday, October 6, Loggia #8One bombing mission yesterday and more rain. Last night, Jerry came over but no action. Today, "A: party moved out to a new field about 25 miles north of Loggia. We leave tomorrow morning. Three dive bombing missions and for a change, no rain. Not much to write about. The morale of the guys is like the weather, stinking, No spirit. They work without any interest. It's the vino that perks them up a bit. It's the same stuff day in and day out. We've now had sixteen months of overseas duty and 15 months of continuous combat. We wonder how much longer they'll keep ul at it. B our ships are in good shape and that's what counts. Yesterday and today, the ships flew to help the 8th Army hold a bridgehead at Termoli by bombing and strafing troops and vehicles on the roads north and west of the town. 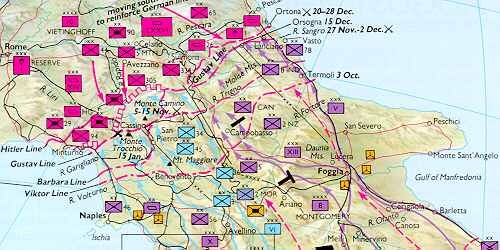 The 57th helped break up the main enemy concentration, struck hard against road movement, especially around Isernia, flew direct-support missions over the battle line, and protected the ground troops against a few Luftwaffe raids. Special Studies, CHRONOLOGY, 1941-1945., Compiled by Mary H. Williams. October 2, 1943 To hasten the advance along Adriatic coast in British Eighth Army area, 2d Special Service Brig (commandos) of 13 Corps lands, night 2-3, near Termoli and secures the town and port; soon joins 78th Div, which, moving N. along coast, secures bridgehead across the Biferno. The Special Raiding Squadron who fight at Termoli alongside the Special Service (Commando) Brigade originated in the SAS Regiment. After the end of the war in North Africa in March 1943, the Army Command thought it was time to disband the many "private armies" created for the Desert campaign, such as the LRDG, the SAS, etc, thinking there were no more use for them. Moreover, David Stirling, having been captured in January 1943, was not anymore there to defend his unit and its concept. The remaining officers, under Stirling 2iC, Paddy Maine, fought to keep the unit alive. The 1st SAS was nevertheless disbanded and broke into two unit : the Special Raiding Squadron, under Major Paddy Mayne, and the Special Boat Squadron, under Major the Earl Jellicoe. The 2nd SAS remained under the command of Bill Stirling (David's brother). The SRS took part in the Sicily and Italian campaigns, including the Termoli landing, (mis)used in a shock troop role. In December 1943, a rather depleted SRS was send back in UK for reorganising. In January 1944, the SRS got back its title of 1st Special Air Service Regiment. As for second query : There was also a group who destroyed an ammunition store in an old fort on the east coast of Italy, can anyone elaborate on this? The 2nd SAS did several raids on the eastern Italian coast between September 1943 and January 1944. But their purpose was to cut railway lines. Maybe during one of this missions did a group destroyed the ammo store ? Do you have some informations about the date of the raid ? For another account of the SRS in Termoli, you could read "These Men Are Dangerous", by Derrick Harrison (former SAS and SRS officer), Grafton Books, 1990. I hope these informations will be of some help. there is an excellent chapter in the book by Cyril ray : Algiers to Austria, the history of the 78th division. which recounts this assault. the sections which took part appear to have been the Canadian tank regiment (b squadron), the Buffs, the Irish brigade, and the Inniskillings. the attack took place on the 6th October 43 in the early morning, the attack was complete by nightfall. and appears not to have been counter attacked. I have just noticed your message and am in rather a hurry, if you are interested i may be able to send more detail later. From what i can gather the whole of the 78th division which these regiments belonged was continually being formed into special groups and used as a general assault resource through ought the campaign. my father was in the Kensingtons which operated bren gun carriers And heavy mortars, he recounts that it was often difficult to tell who they were attached to. a bit of a sore point as the British army now denies his activity in north Africa as it was not adequately recorded,and will not give him the campaign medals, but he sure knows that he was there, at Tunisia and the battle of longstop. "By the end of September (1943), the Allied invasion had fully secured its objectives, the Germans having retreated to defensible positions north of Naples along the Volturno River in the west and, in Eighth Army territory, along the Biferno, which empties into the Adriatic a few miles south of Termoli....Eighth Army began its attack on the Biferno positions on Oct. 1st, with the 78th Division advancing along the coast toward Termoli, while the Canadian 1st Division moved toward Vinchiaturo along the Foggia-Isernia lateral road. On the night of Oct. 2/3, a British commando unit made a seaborne landing behind the enemy lines and linked up with the 78th. Then Termoli was quickly taken, though a German counterattack, beginning on the 4th, bitterly contested the 78th's hold on the city for several days...."
Do these dates tie in with your information? If so, that was your Dad's raid! My friend has no knowledge of Camp Qassassin. I would think the British War Office might have information on this. 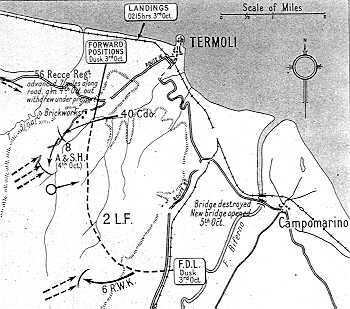 But speed and surprise were the elements aimed at, and it was decided to land two 85 commandos of the Special Service Brigade in Termoli by landing craft, for 11 Brigade to join them as quickly as possible by land, across the Biferno, and for the other two brigades to follow by sea when Termoli had been secured. As the commander of the Irish Brigade noted, "as far as my Brigade was concerned it was to be a pleasant peacetime cruise, with fighting unlikely for a fortnight or so. And Termoli was known to be a nice little town." Adding ruefully, "Note: this did not go according to plan." But it all began smoothly enough. The two commandos, 3 and 40, with the Special Service Brigade's reconnaissance squadron, all under command of Lt.-Col. Dumford-Slater, embarked at Bari and landed successfully. By eight o'clock on the morning of October 3-they had easily overcome the weak garrison, and 36 Brigade was able to land unopposed that night and to begin to push towards the north. In his book, "Winged Dagger, Adventures on Special Service", author Roy Farran credits the seizure of Termoli to the 1st SAS Regiment, No. 3 Commando and No. 40 Marine Commando. The attack was apparently carried out by a landing force. Unfortunately the author, himself an officer in the SAS, does not elaborate on the roles played by these units in the battle. I have the following from 'The SAS at War' by Anthony Kemp. John Murray (1991). Around mid-March 1943 the Special Boat Squadron was essentially detached from 1 SAS Regiment. The remainder of the regiment, about a squadron (company) in strength were redesignated the Special Raiding Squadron (SRS). Strength about 250 men, organized in three troops. The SRS did take part at Termoli with the Special Service Brigade (commandos). Two groups of 2 SAS were also on the scene at Termoli - one group in jeeps had advanced overland with 78 Div - another group arrived at the harbour in assorted craft - both on 3 October 1943. There is a good brief description of the battle for Termoli, in the book, A HISTORY OF THE SAS REGIMENT, by John Strawson, Grafton Books, London, 1986. Major Sandy Scratchley is among those mentioned in the book. The "Special Raiding Force" at Termoli was formed by members of the SAS. There were also members of The Parachute Regiment involved. It could be that your father was on attachment as signaller to either regiment. Best wishes - Sidney Allinson (ex-RAF) Victoria, British Columbia, Canada.